China’s economic growth has been very strong for a decade, making Australia one of the richest countries in the world. China has buffered us from the GFC, boosted exports, lifted house prices and invested in our businesses. Forecasts are for more of the same: At Budget time, Australia predicted growth of about 7 per cent for China until 2017. But Harvard Professor Lant Pritchett is doubtful about those forecasts. The economic development expert has published a working paper full of reasons why China is far more likely to come to a bust than continuing boom. If he is right, the Australian economy will be stuffed (a technical term) and we’ll probably all lose our jobs. This is the unique angle of his story. Pritchett doesn’t purport to analyse China in depth. He looks at economic history, comparing China’s streak of success to other countries’ growth spurts, and predicts reversion to mean. I’m inclined to think this approach has strengths. The current trope about Chinese policy-makers is that they simply set the level of economic growth that they want. If this is true they are the only country in the world with that power. What do we really know about the Chinese economic policy-making apparatus? We know only that it has been very successful, according to its own statistics. And everyone acknowledges those statistics are rubbery. Pritchett compares betting on China to investing in the best-performing managed fund – past performance is no guarantee of future performance, he cautions us. His paper shows the correlation between growth in one decade, and growth in subsequent decades is low: from 0.3 for adjacent decades, down to around 0.1 for decades separated by 20 years. Pritchett instead suggests China will grow at an average of 3.3 per cent a year over the next decade. That means China’s GDP will be about half of what it would have been by 2033 than if it grew at 7 per cent. 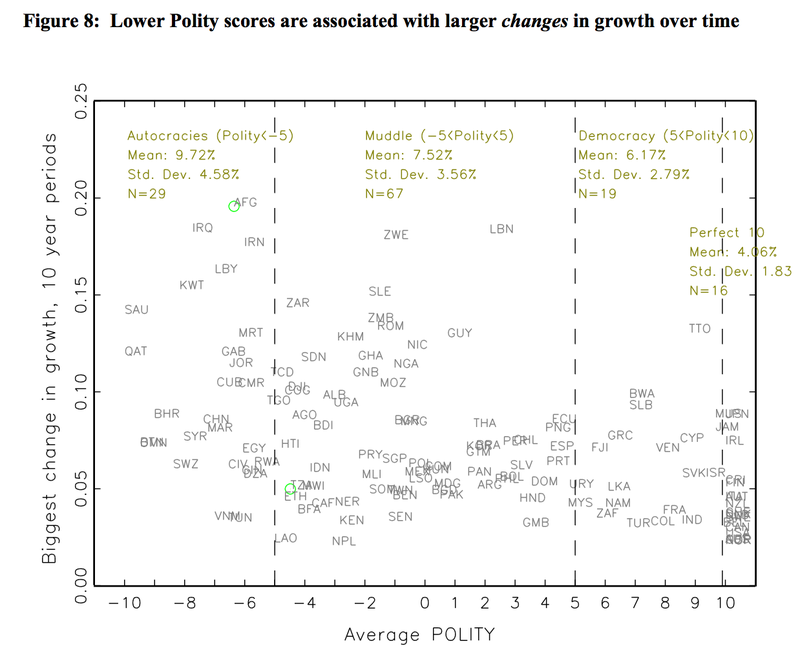 Pritchett does make one concession to analysing China itself, and that is to note that growth is, on average, less variable in countries that are more democratic. So if China crashes, what should you do? 3. Get out of shares. Australia’s corporate profits depend on Australia’s growth, which depends on exports to China. A China collapse and a stock-market collapse would look like that Olympic event where the two divers leap from the platforms at the same time. 4. Sell your property. China props up our house prices directly (by bidding on them) and indirectly (by making us wealthy). When the firecrackers stop popping in Beijing, auctions in Australia are going to be cold and quiet for a few years. In summary, let’s all hope Mr Pritchett is really wrong. That’s all a bit scary. The only problem is not if things will go pear shaped but getting the timing right – things could easily tick along for a year or two longer. Selling houses is also kind of a big, inconvenient and expensive transaction to make if you get out too early – after all you have to live somewhere and kids benefit from some stability. Are you going to put your cards on the table and predict a percentage fall in house prices in Melbourne or Sydney? They have looked over-valued to me for a good 5 years and they are still stubbornly staying high. The real problem in opinion is that we have steadily passed on more and more risk to households who are not always well placed to judge it and manage it. They are also not diversified enough to withstand large losses which is what a property crash will do. The ideological culprits for this idiotic state of affairs are from mainstream economics – which is obviously flawed. Do you think of Guy Debelle’s speech warning of a sell off? A small point, but milk exporters won’t necessarily be in a bad state. Chinese people’s incomes can keep growing at the same time that growth plummets, as happened to Japan in 90s. On the question of property, it may be the case that a downturn in Australian property prices will lag behind China. If a major economic downturn does eventuate in China, you’d expect even more wealthy Chinese will be looking to move to Australia and stimulate demand that way. If worse comes to worse, the Australian government can always tie property ownership to obtaining permanent residence as a way of propping up prices. I’m curious about your sources for the “China saved Australia in the GFC” theory. Commodity prices? Brazil is a large iron ore exporter, so too is South Africa and Canada, all went into recession and besides, Australia’s top mineral exports dived in 2008. Terms of trade? Euro, Japan, Russia all had greater trade relations with China than Australia. All went into recession. I don’t discount there are other reasons, however, I believe every analysis that you hold for Australia’s economic relationship with China buoying the Australian economy is debunked by facts in other parts of the globe. Interested to hear your theory. Previous Previous post: Why the Nobel Prize is worth a little less this year. Next Next post: Buy Australian: About as sensible as F*ck Off We’re Full.